Hoist Controller Market size will exceed USD 104 million by 2025; according to a new research report by Global Market Insights, Inc.
Hoist controllers can be used as an equipment to move the hoists in the required directions to ease the material handling processes. Increasing demand for electric and hydraulic hoists will increase the hoist controller market size over the projected period. Moreover, rising industrialization practices in developing economies will further rise the need for hoists, which require mandatory controller equipment. The global hoist controller market will witness some opposition to growth because of the availability of low-quality hoist controllers. Moreover, scattered market, coupled with very few choices of water proof controllers’ availability will further affect the global hoist controller market growth negatively. The electric type holds a major share of global hoist controller market, which had a market share of more than 90% in 2017. This will grow at CAGR of more than 3% and surpass USD 100 million by 2025. Hydraulic hoists use a very low share of global hoist controller market. This segment will witness growth at CAGR more than 2.7% and will reach USD 1.8 million by 2025. Handheld hoist controllers held the lion’s share of over 94% in terms of revenue in 2017. This will increase at a CAGR of more than 3.0% and will surpass USD 99.2 million by end of forecast period. Automatic hoist controllers will increase at a lower CAGR compared to handheld hoist controllers. This segment’s size will cross USD 5.5 million by end of projected period. Handheld hoist controller market for use in cement industry held the largest share in 2017. This will surpass USD 19 million by 2025, at a CAGR over 3.1%. Automatic hoists for construction end-user had the largest market share in 2017. This will reach USD 840.0 thousand by 2025, growing at CAGR of more than 2.5% throughout the forecast period. Strong growth indicators of construction industry in Asia Pacific and Latin America will subsequently boost hoist controllers demand in the near future. Asia Pacific regional market is expected to cross USD 32 million by 2025, growing at a CAGR of over 3.3%. 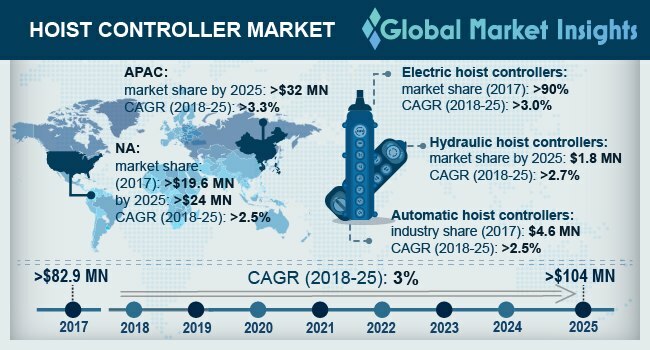 North America hoist controller market has the second largest share of global hoist controller market, and it will cross USD 24 million by the end of 2025, at CAGR more than 2.5%. Prominent players in the global hoist controller market are Uesco Cranes, Eastern Electric Corporation, Magnetek Inc., Speed-O-Controls, Schneider Electric, Conductix-Wampfler USA, and Hoosier Crane Service Company.